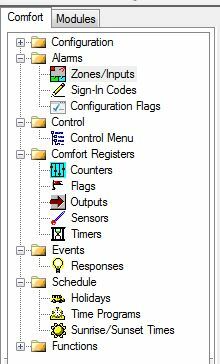 Comfigurator 3.12.1 introduces several new View Modes which reveals only the features that are relevant to the application, and hides other features and settings that are not needed. This is because Comfigurator has become quite powerful and complex over the years, and may be confusing to new users. The Restore and Partition fields are hidden, as they are not used as often. Restore is set to On by default. Restore tells the dialler to dial out to SMS and CMS when the zone is restored after an alarm. Partition selects the zone to be one of 4 partitions in the alarm system. Partition is set to 0 by default. In order to change the Restore and Partition settings for the zone, change the View Mode to Engineer Advanced. 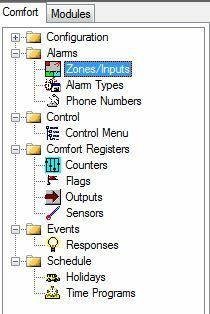 Even though the fields are hidden in Engineer simplified and other modes, the setting or parameter can be changed in Engineer Advanced.